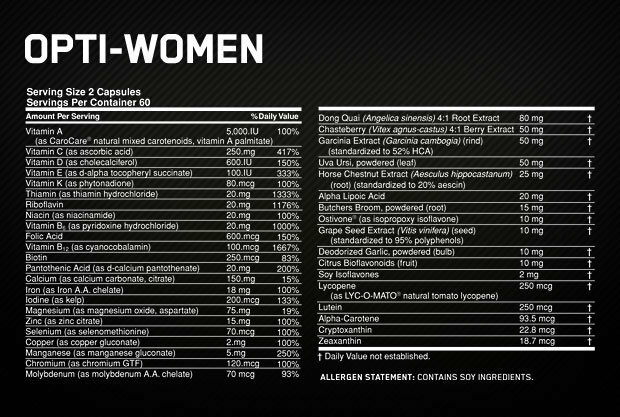 Opti-Women By Optimum Nutrition at SameDaySupplements.com® for lowest price. Optimum Nutrition's Opti-Women combines 23 Vitamins and Essential Minerals with 17 specialty ingredients to create a comprehensive multivitamin for the active woman. Each serving of wide-reaching nutrient support in Opti-Women is delivered in Vegetarian Society approved Vcaps. As a dietary supplement for women, consume 2 capsules of Opti-Women daily with food. We have a large selection of in-stock OPTIMUM NUTRITION products including Women's Health items and others for the lowest prices at SameDaySupplements.com® It's always easy to shop for Opti-Women By Optimum Nutrition at SameDaySupplements.com® because you can browse by reviews, brand, prices or search for specific ingredients using our search tool. In-stock orders placed before 3pm EST ship out the same day to USA, Brazil, United Kingdom, Canada, Germany, Australia, Japan, India, France and worldwide at the cheapest prices online.